Learn about the A' Design Award & Competitions' Pre-Selection Committee , its' roles and functions. A' Design Award features a Pre-Selection Committee to improve the efficiency of the accolades, and to create further value for participants. A' Design Award Pre-Selection Committee must check all the entries to establish whether submissions meet the rules of the competition. A' Design Award Pre-Selection Committee will also notify entries that do not conform to the "presentation guidelines" or "award criteria", each entry will pass the "Preliminary Round" where the Pre-Selection Committee suggest ideas and provides honest opinion about the entries. A' Design Award's Pre-Selection Committee is slightly different from other Pre-Selection Committee structures that would be onserved in other accolades through the powers allocated. A' Design Award Pre-Selection Committee does not have the ability to "eliminate entries", i.e. 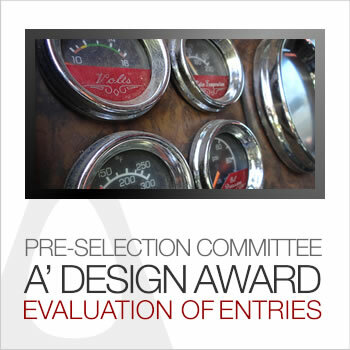 the A' Design Award Pre-Selection Committee cannot "eliminate" or "vote" your entry. If you submit a design, the Pre-Selection Committee will give you insights, and a preliminary-score, but this preliminary score does not effect the result of the accolades as it does not count towards a jury vote. The only power given to the "Pre-Selection Committee" is to "disqualify", i.e. to ensure that entries that could create potential issues would not be allowed to the accolades; i.e. Pre-Selection Committee will disqualify any entry that creates Intellectual Property issues or problems, as long as it is noticed. Pre-Selection Committee is composed of experienced design scholars. Roles of the Pre-Selection Committee Check all submissions, comment on all submissions, suggest the correct design award category for all entries, provide feedbacks on presentation, provide an honest score about the project or forward the entry to another Pre-Selection Committee member for preliminary-evaluation, soft approve or soft reject entries, disqualify entries that has intellectual property problems, suggest ideas for entrants to improve their entry presentations, mentor entrants by providing also ideas or suggestions on composition of visuals or remind attention to details, ensure that all submissions are in-line with the presentation guidelines, get help from the award jury if an entry cannot be understood or evaluated, ensure submitted entries are not identifyable, ensure the quality of presentations are at a certain level, ensure the entrants' ideas are clearly communicated, ensure the entrant has completed the submission process completely. To help the Pre-Selection Committee deal with the thousands of entries submitted, an artifical-intelligence software was written which checks the entries for technical issues such as pixel sizes or resolution of images, lenght of text fields etc. This is called the Advanced Submission Optimizer, and will check your entry for thousands of different technical issues and create a report to help enter your works correctly. The utilization of this software is free of charge and available after registration.